Bluetooth technology opens up a world of wireless connections within your home. It’s the perfect solution to reduce clutter and takes away the need for messy cables. It’s modern, tidy, secure, and it looks like it’s here to stay. You would have thought to convert vinyl analog to digital audio would be to completely take away the essence of the old-fashioned record player. The thought of a Bluetooth phonograph does seem strange but, in fact, this combination of new and old technology has a lot to offer. The ability to wirelessly stream music around your house, via a record player with Bluetooth capability, is a very convenient feature for many people. The following reviews should give you a deeper insight into the different Bluetooth options available. We’ve analyzed and researched the most popular products and picked out our top Bluetooth turntable. It’s nice to switch off and relax sometimes, but it’s even better to switch on whenever you want to hear the music! The Trimmit TMT1000 Bluetooth record player is a stylish unit. It has clearly been designed with both performance and connectivity in mind. The components used in this belt-driven turntable are far from basic and definitely help to enhance the sound quality. The anti-skating, adjustable counterweight, and moving magnet cartridge all come together to increase the overall sound performance. The TM1000 has a full stack of Bluetooth wireless options that lets you connect to external speakers within a 33 ft radius. It also gives you the option to stream in any music that you have on your phone or other Bluetooth-enabled devices. It’s great to see both of the in/out Bluetooth functions being put to use here. It makes full use of the technology and onboard speakers. As with most modern turntables, the USB connection has been included to help you convert your records into a digital mp3 format. The additional Audacity software (PC and Mac) makes this process painless and straight forward. The TM1000 is capable of playing both 33 ½ and 45 RPM records and if you do find the need to connect up to a Hi-Fi system then the RCA audio output will let you do so. The price tag is slightly higher than the other options, however, we think that the overall build-quality and sound performance justifies this extra cost. Victrola has been around and making record players for years. The fact that they can produce a unit that is Bluetooth-enabled, full of features, and excellent value for money is a testament to their experience and success. Let’s make it clear that the Victrola Vintage is a budget unit and high-end sound performance should not be expected, yet it still manages to offer a handful of features. The Victrola is classified as a suitcase turntable – a trend that has grown immensely popular in a short amount of time due to its captivating vintage look. The Bluetooth connectivity allows you to easily pair up with Bluetooth-enabled devices to play music through the onboard speakers. Also, the addition of the AUX jack allows you to wire up any mp3 players or 3.5mm audio devices. In terms of output, you’ve got the headphone jack for private listening and, if the need arises, you can connect to external stereo systems via the RCA Audio output. The Vintage turntable from Victrola is hands down the best budget buy on the market at the moment. It’s clear that sound performance is often sacrificed for the additional Bluetooth functionality. However, Bluetooth record players are built for convenience, not sound perfection. Overall, this turntable is great value for money and makes a perfect choice for casual listeners and first-time buyers. Audio Technica is a company who always seem to deliver quality turntables and value for money. The AT-LP60-BT is no different, however, we must stress that this unit is built for one thing in mind – Bluetooth connectivity. It’s clear that other areas have been sacrificed but we think that the overall performance is still impressive regardless. One thing that we first noticed is the basic appearance. The decision to use a plastic casing does make it look cheap and dated. However, as you start to look around at the features and listen to the sound performance, the unit eventually comes to life. The belt-drive mechanics underneath a die-cast aluminum platter give a consistent, clean sound and minimizes any unwanted vibration. The Audio-Technica cartridge is better quality than most others we’ve seen, plus, the replaceable diamond stylus makes future upgrades a possibility. You can play either of your 33 ⅓ and 45 RPM records with the useful automatic start/stop feature. The Bluetooth connectivity allows you to store up to eight different devices, allowing you to easily switch and listen between headphones, speakers, and any other Bluetooth-enabled devices. It’s easy to see that this turntable is solely based around Bluetooth and some purists might not take to the overall design and build quality. However, we think that it’s a brilliant option for any first-time buyers with the affordable price tag and modern connectivity features. To start off our Bluetooth turntable reviews we’ve got the Wockoder. It not only looks smart but plays smart as well. The natural wood appearance gives the turntable a modern look that is often lacking in designs. The die-cast aluminum platter and belt driven motor make for a sturdy unit, reducing vibrations and unwanted noise. However, as we said, this Bluetooth compatible turntable has a lot more going for it other than just the looks and build quality. The Wockoder is a flexible unit and loaded with features. Converting your vinyl collection into mp3 digital files is made easy through the USB connection. Just plug in and record, it couldn’t be simpler. You’ve got three playback speeds to choose from (33 ⅓, 45 and 78 RPM) and the WOCKODER will comfortably play 7”, 10” and 12” records. You’ve got the option to wire up to external speaker systems via the RCA audio outputs. The AUX and Bluetooth functionality converts the turntable into a music player for your mp3 players and Bluetooth-enabled devices, furthermore, playing your vinyl through external Bluetooth speakers and headphones is a simple process. Built-in stereo speakers (2 x 5W) are a welcome feature and being able to play music via the Wockoder in various situations is going to make this a popular option for many. The 1 By One Bluetooth enabled record player is another solid design that manages to combine both looks and a wealth of modern features. The solid wood appearance helps to give it that retro feel and the belt-driven motor will give you consistent playback performance. We do like the look of this unit, and much like the Wockoder turntable, the design certainly helps it to stand out from other cheaper looking options. The built-in speakers are designed on a stereo active, 2-way, crossover system which really helps to optimize the overall sound performance. The Bluetooth connectivity allows you to use the turntable as a standalone speaker, however, it doesn’t give you the extra option of connecting it to external speakers. The ever-useful USB slot lets you record and save your classics with the vinyl-to-mp3 functionality. Connecting it to a traditional Hi-Fi system is also available via the RCA audio output. 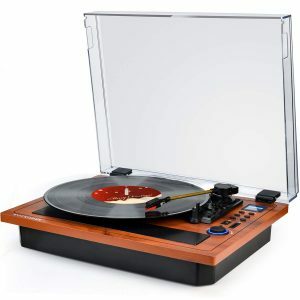 In summary, the 1 By One Bluetooth vinyl player is another great choice for those who prefer the vintage look but still require the modern-day features. The slight downside is that you can’t connect to external Bluetooth speakers. This lack of flexibility proves that the unit is not perfect, but it is fairly priced and still gives you plenty of playback and recording options. The JOPOSTAR Bluetooth-enabled record player is another well-designed unit. The wood finish makes it look a lot more professional than some of the other plastic-built options. In terms of playback, this belt-driven turntable offers three speeds: 33 ⅓, 45 and 78 RPM. The JOPOSTAR made our shortlist because it has more than enough features to keep any casual listener and beginner happy. The built-in Bluetooth connectivity is the focal point around all these turntable options. While some of them offer both in/out options, unfortunately, this unit only offers playback on the built-in speakers. The ability to stream your vinyl to other Bluetooth-compatible devices is missing. It does seem strange to leave this out when Bluetooth is the main attraction of the product. Nonetheless, the JOPOSTAR manages to add a few more features that are worth talking about, including the USB function for recording vinyl to mp3 and the RCA audio outputs for wired speaker connections. The best part about the JOPOSTAR turntable is that it’s nearly half the price of the other Bluetooth turntables we have reviewed so far. This Bluetooth record player is definitely worth considering if you’re looking for your first turntable. Plus, the fact that it acts as a standalone Bluetooth speaker will bring some additional benefits to your home music setup. The Crosley Dansette Bermuda turntable is in a league of its own when it comes to aesthetics. It has that retro look and would easily make an eye-catching focal point in any home. The case not only looks stylish, but it does a great job of protecting the inside parts as well. It’ll play your 33 ½ and 45 RPM records with ease and has plenty of connection options. It’s evident that this belt-driven turntable is only able to offer standard sound quality. We can’t help but feel that the majority of the design has been spent on the external fascia rather than the internal components. While the plastic knobs keep in line with the retro look, some of the internal design could easily be improved. The excessive tracking force is often picked out as a common problem and will likely cause increased wear and tear on your records. It’s not all bad though, with an Audio-Technica MM cartridge and a replaceable, diamond stylus, the sound is consistent enough and will satisfy the casual listener. The Bluetooth connectivity lets you use the Dansette Bermuda as a standalone speaker and you’ve got the AUX and Headphone jacks for further playback options. The price tag is a little higher than we expected and it’s very much a case of style over substance with this Crosley turntable. Choosing the right Bluetooth turntable comes down to a simple question. Do you already have Bluetooth devices at home? If the answer is yes then a Bluetooth turntable is going to be a rewarding purchase. Here are some of the main things to consider, starting off with the most important feature – Bluetooth. You may have noticed that many of the reviews above show various levels of Bluetooth connection. Some of them offer both In and Out, while others only offer In. The main difference between the two is that Bluetooth Out lets you stream the music from your turntable to external devices. This gives you the option to enjoy your vinyl collection anywhere in the house, out loud via speakers or privately through headphones. Bluetooth In converts the turntable into a standalone speaker. You can use any of your Bluetooth-enabled devices to stream and play music via the onboard speakers. Deciding on which Bluetooth connections you need will depend on your situation and how you intend to use your turntable. If you already have Bluetooth speakers or headphones in your home, then opting for the In/Out functionality is an obvious choice. You can make good use of your existing gear and enjoy your vinyl collection wherever you are in the house. It seems to us that the Bluetooth Out option is what makes these turntables so flexible. Bluetooth In is just a bonus and not really relevant to your enjoyment of vinyl music. Buying a turntable with Bluetooth capability is going to affect the overall sound performance, that’s the truth of it. The Bluetooth concept means that most low to mid-range turntables will be built with plenty of plastic components. Plastic does not go hand in hand with high-quality sound. The sound isn’t terrible but it’s nothing to sing about, that’s for sure. The real reason why most people purchase turntables with Bluetooth is for the convenience. They want to listen to their music around the house and not be limited to the room where the turntable sits. In simple terms, sound quality is replaced with convenience. If you understand this then we’re sure that you’ll get plenty of enjoyment from buying a Bluetooth turntable. You can always upgrade later on if you want to enjoy the finer sounds of vinyl. Upgrades – Being able to upgrade components such as the stylus will prolong the life of your turntable. Choosing high-end upgrades might also help to increase the sound performance.